Snow covered the ground and the temperature hovered at zero degrees on the morning of January 24, 1925. Businesses were closed—or planned to open late—as crowds gathered on hilltops and rooftops throughout Connecticut. Special trains brought visitors from Boston and elsewhere in Massachusetts, and scientists from around the country joined colleagues at Yale, Wesleyan, and Trinity. The sun had come up as normal, but about 8:30 a.m. it began to grow dark again, as the moon passed between the earth and the sun. At about 9:13 a.m. the eclipse was total, lasting almost two minutes in parts of the state. Church bells chimed and factory whistles blew and automobiles, trains, and trolleys throughout the state came to a standstill. 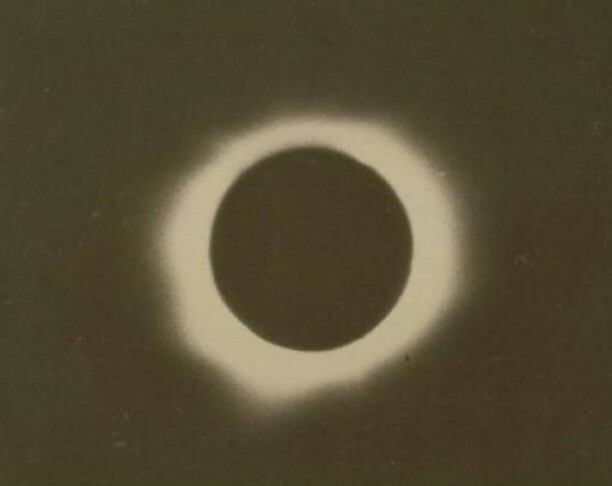 For weeks in advance, newspapers had advised the use of smoked glass when viewing the eclipse and had recommended limiting the amount of time spent looking directly at the sun. The Gustave Fischer Company in Hartford sold what they called “filmeo,” special cards that enclosed a piece of exposed photographic film to protect viewers’ eyes from the sun’s light. Those wishing to get the best views of the corona (the rays of light surrounding the sun during a total eclipse) were advised to bandage their eyes for an hour before in order to improve their night vision. Spectators in Willimantic got some of the best views. Thirty thousand people crowded the rooftops of the Thread City, 5,000 of them on Hosmer Mountain. Fox Hill in Rockville was another favored viewpoint, as were Hubbard Park in Meriden and East Rock and West Rock in New Haven. In Hartford, the public were invited to the Trinity College campus to witness the event. 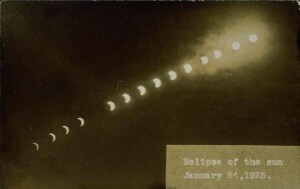 Worldwide, eclipses are not rare occurrences, but the moon casts a narrow shadow, and throughout history very few total eclipses of the sun have been visible in New England. The eclipse on January 24, 1925, was the last total eclipse to be visible in Connecticut; the next total eclipse to be visible here won’t happen until May 1, 2079. “Fox Hill Mecca for Sun Gazers: Eclipse Observers Appreciated Snowless Standing Room.” Hartford Courant. January 25, 1925. “Gus Fischer Offers Best View of the Eclipse.” Hartford Courant. January 23, 1925. “Tells How to Watch for Coming Eclipse.” Hartford Courant. January 23, 1925. “To Drop Business for Sun’s Eclipse: Hartford Concerns Will Open Late or Be Closed All Day Saturday.” Hartford Courant. 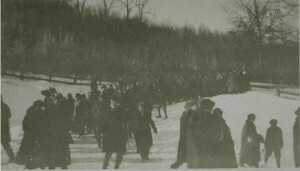 January 21, 1925. “Willimantic Sees Eclipse Perfectly.” Hartford Courant. January 25, 1925. Get Out Your Paper Dress, Gal! – Who Knew?